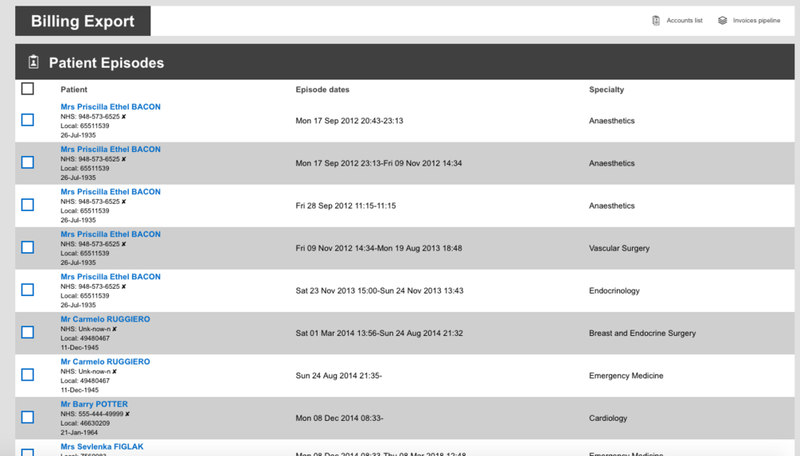 PatientSource’s billing module works both in the NHS and Private healthcare sector. For the NHS, it can capture overseas patients who are not entitled to free at the point of care health services. Tests, procedures, medication and overnight stays can be linked to appropriate tariffs so that the Trust is fully reimbursed as needed. For Private healthcare, subscription-based billing and vouchers can added to the system with fully itemised invoices ready for the patient to pay or to be sent to the appropriate insurance company. Time Saving – links with HRG, ICD10 and OPCS as well other coding systems ensure that the right price is charged. Automated, itemised billing – tariffs set in PatientSource ensures that billing is quick and easy ensuring that time from discharge to invoice is short. Easy reporting – this can be anything from current debt levels to finding the top procedures. Links to payment systems – PatientSource can link with payment systems so that accounts in PatientSource are updated directly from the payment system.